Made from real potato. Suitable for vegetarians. 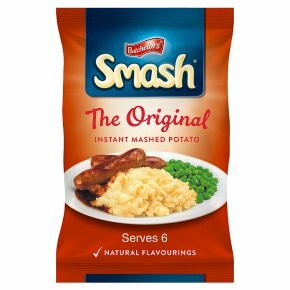 Directions To make half this pack: Put 88g of Smash into a bowl, add 425ml (approx. 3/4 pint) of boiling water and mix with a fork. Add more flake or water for desired texture. To make one portion: Measured method - take 30g of Smash, add 150ml (approx. 1/4 pint) of boiling water, mix with a fork. Add more flake or water for desired texture. Chef's Tip! For an even more smashing taste, add butter or milk and season with salt & pepper.